I am very lucky to work in very close proximity to the Sussex County Master Gardeners, who are a volunteer corps of Cooperative Extension. I am not sure how many are in currently active in the county, but judging from their monthly meetings, we have more than 100 active volunteers. Each talented individual brings something unique to their volunteer service. We have Master Gardeners who write press releases, others who do training of staff and administrative work. Many go out into the community and teach at libraries and garden centers. Others answer phones on our seasonal helpline, and a large portion work in a teaching garden, known as the Demonstration Garden. Recently my office moved toward the back of the building and my window overlooks the hydrangea section. I can see University of Delaware’s blue and gold tent, under which many free or very low cost workshops are offered during nice weather. The Demonstration Garden is open to the public, who benefit from the clearly marked flowers, annuals, trees, shrubs and specialty attractions. Each year, something in the garden is added and changed. A big emphasis in the last few years or so has been on Accessible Gardening, or “Making Gardening Smart and Easy” by incorporating raised beds, pulleys and the many tools that are available to encourage gardening at any age. I can still bend over and kneel to weed and dig, but it is going to get harder as I age. Good to know these resources are around. Nothing should stop anyone from gardening! 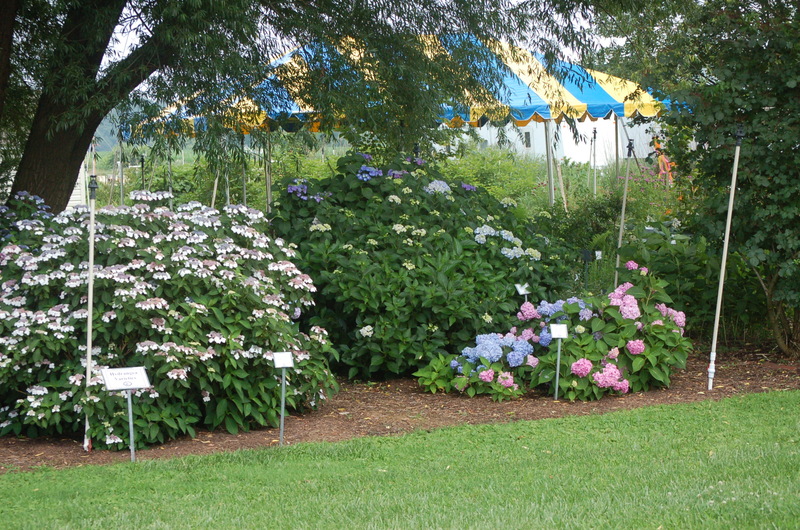 Sussex County Master Gardeners do however, have one special day, their Open House, this year on Saturday, July 13, when the Master Gardeners will be there in force, to answer questions, conduct workshops, sharpen tools and share their enthusiasm and knowledge. 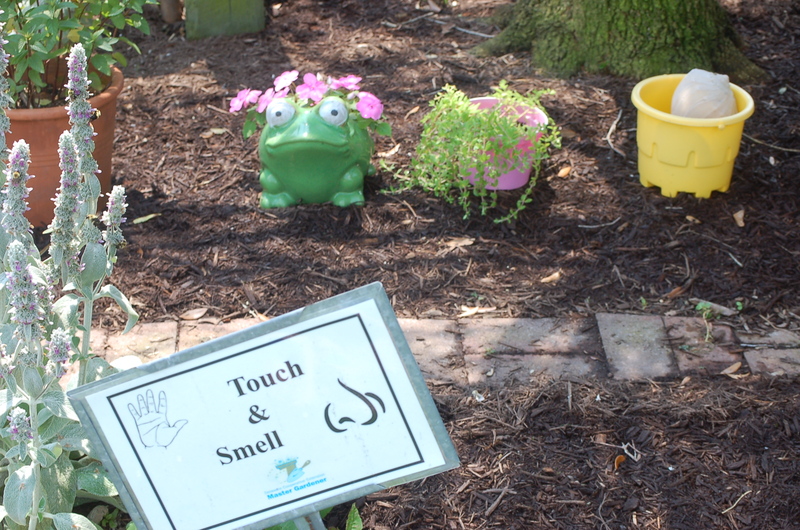 There is something for everyone; a children’s garden, with fun things to touch, taste and smell, a shade garden, and if I am not mistaken, a beautiful contemplative garden too. When I retire, and if they’ll have me, I will sign up for the intensive and very thorough training offered by both University of Delaware and Delaware State University’s experts. In the meantime, I am content to drift past the flowers and sneak a couple of photos on my lunch hour! If you are in the area on July 13, you can too! Here’s more information on the Sussex Master Gardener Open House and here is a link to pictures I took at the 2012 event. 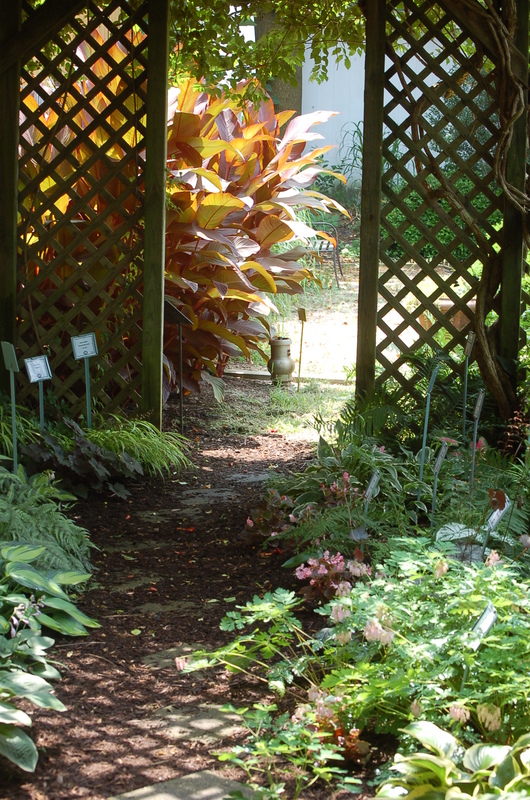 Each year the Master Gardeners who tend to this demo garden, add garden art. 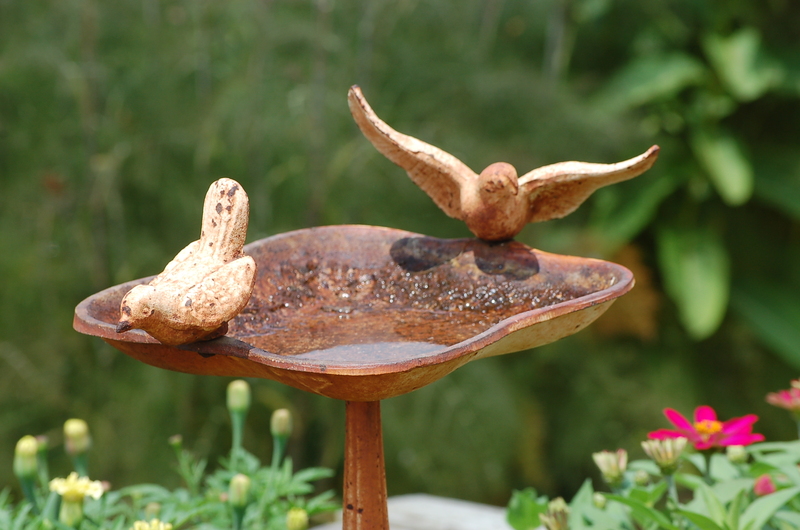 Love this bird bath! 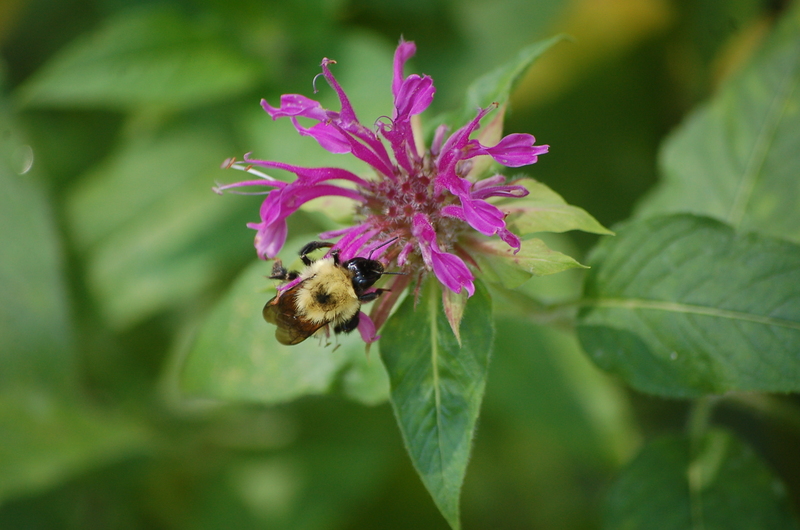 They don’t call it bee balm for nothing! Two are busy collecting. 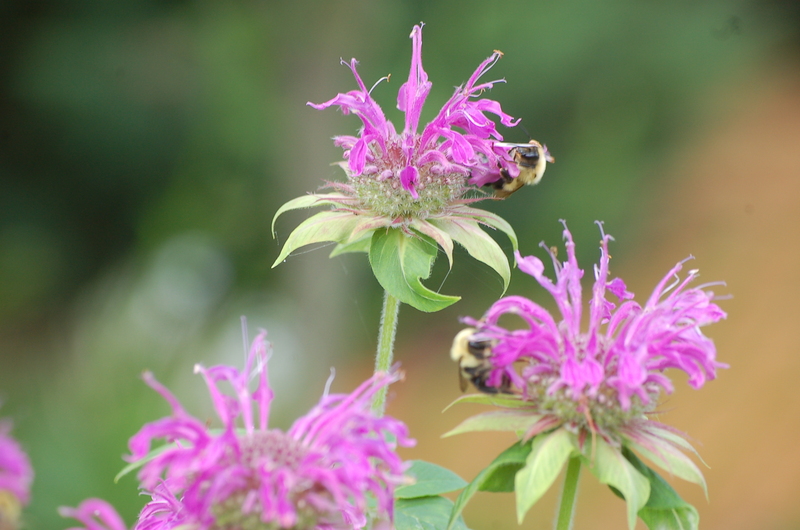 These Monarda are a pretty shade of magenta! The view from my office window. Hydrangeas! 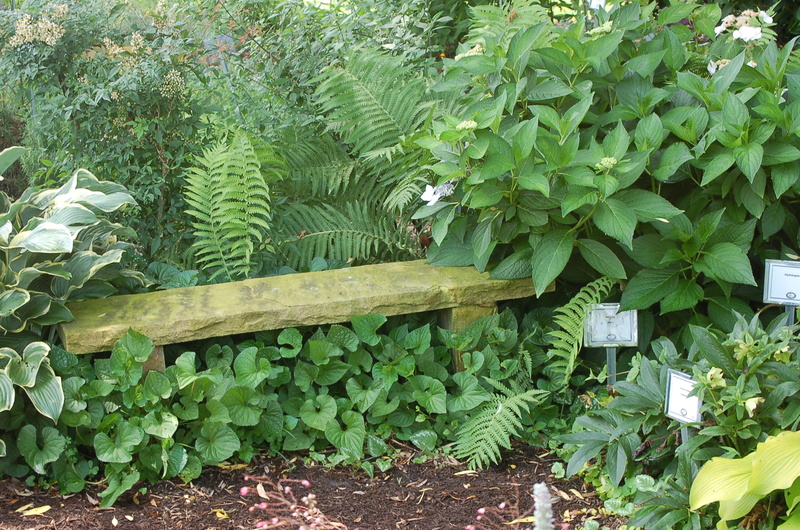 All plants are labeled with the common and official Latin name. 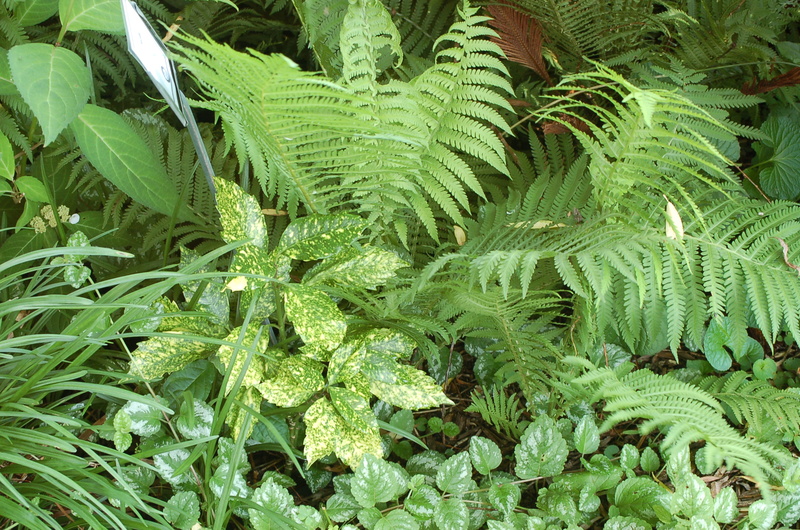 Those plants that are native to Delaware have a special designation at the bottom right. This bee has a pollen mother load on its legs! 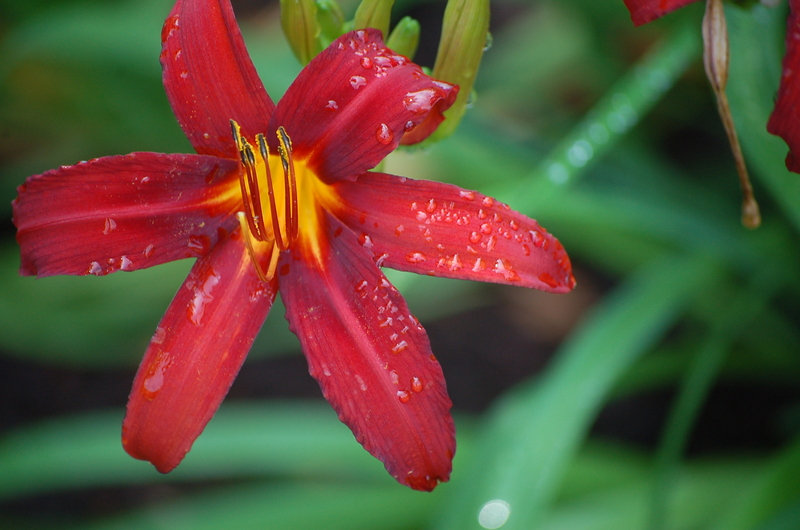 A bold burst of red, just showered by the sprinkler system! 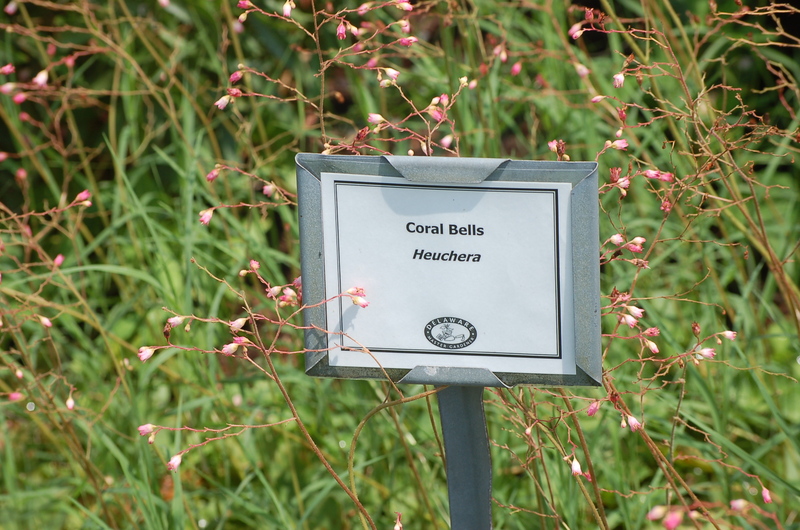 Coral Bells. 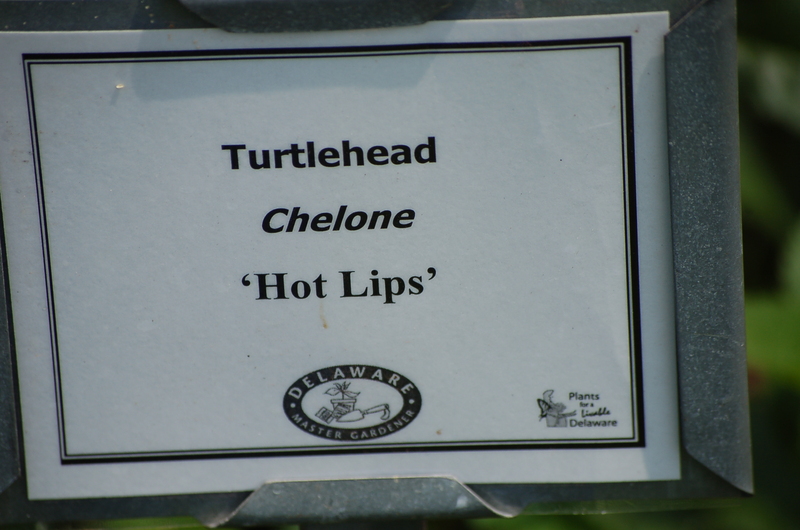 As an educational Demonstration Garden, all plants are clearly named. 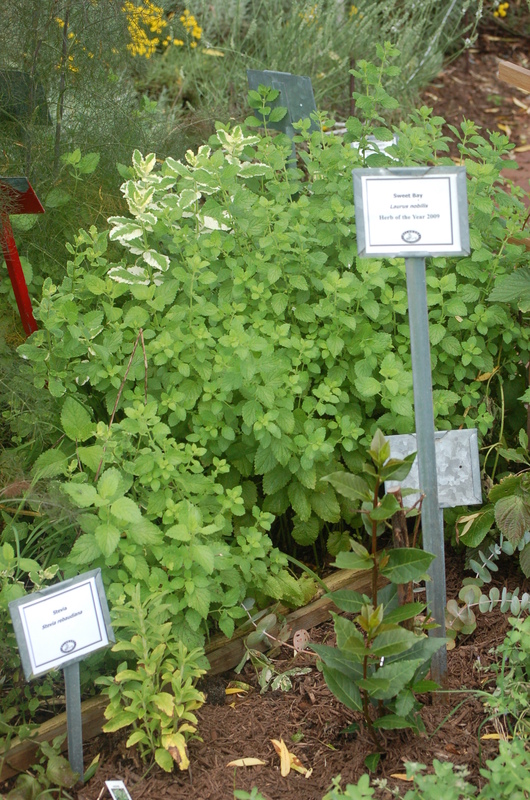 Herb Garden. Think they’d mind if I snipped a few sprigs here and there? 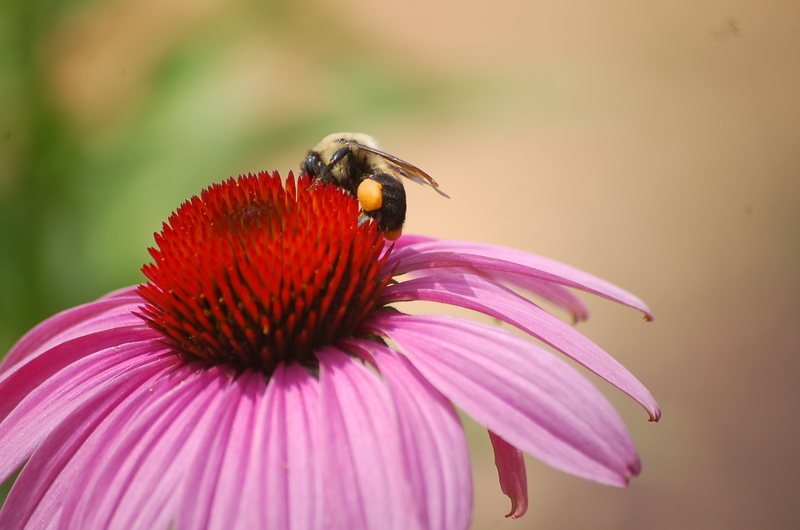 The wonderful world of bees!